If you’ve had the pleasure of staying in a hotel recently, chances are you’ve noticed a few technology upgrades, and smart room keys, tablets, and televisions are only the beginning. The hospitality industry is implementing the latest technological advances for more reasons than one. These upgrades are meant to not only impress visitors but create an even more comfortable and relaxing atmosphere. After all, what’s better than accessing breakfast in bed from the click of a button? At Evergreen, we’ve been on the forefront of working with our hospitality partners put these technologies into action. The possibilities for the future are truly endless. Hotels of today have installed everything from Smart TVs which allow guests to stream their favorite shows and movies to Amazon Echo and Google Home which offer temperature adjustments and local weather via voice control. Incorporating these technologies simulates a home environment while creating a comfortable space. Many hotels have also replaced traditional amenities books with tablets. By tapping through a menu, guests can order room service, set a wake-up call, request their car from the valet, or communicate with the concierge. 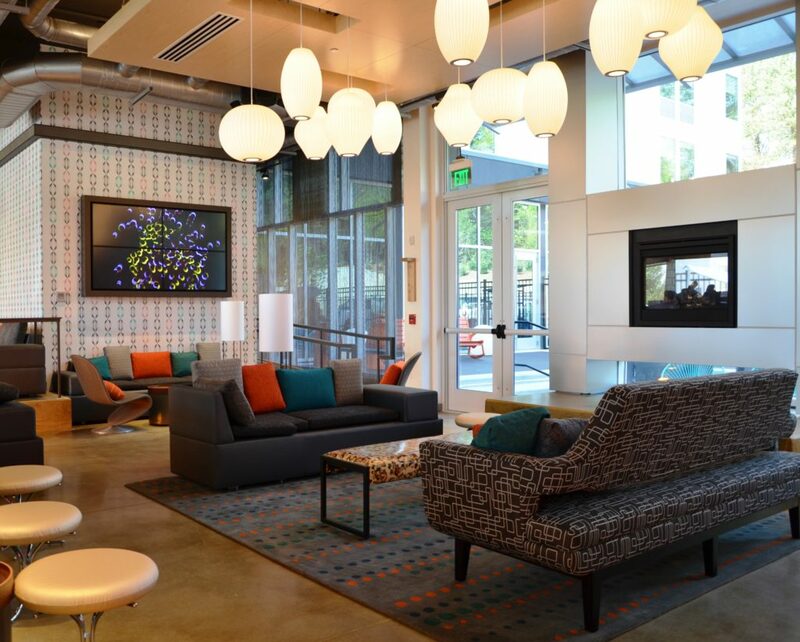 Essentially, hotels are using technology to customize the guest experience as much as possible. Customizing the experience is something that we know our hospitality partners value for both their guests and themselves. Internet speed within hotels is becoming increasingly more difficult to provide. It is not enough to simply have WiFi for guests. Enough bandwidth is needed for guests to be streaming TV while using their tablets simultaneously with their smartphones. As a result, some older hotels are renovating infrastructure to support the additional demands on WiFi. We always encourage our clients to consider their bandwidth needs prior to and during construction. In addition to carefully considering the technology needs of guests, we also help our clients with their own technology needs, especially when it comes to cost savings. As expected, more energy efficient fixtures and HVAC equipment can result in savings for the hotel. However, there are also some unexpected, hidden savings that we like to point out. For example, by utilizing RFID technology, guests can use their smartphones as room keys which saves the hotel the cost of room key cards. While at first glance that might not seem like a huge savings, room key cards cost on average $2 per key. Let’s say a hotel has a 100 unaccounted for cards per month. That is a yearly savings of $2,400. Plus, let’s be honest: we’re confident there are many more unaccounted for keys than that! Our expertise in hospitality construction is evidenced by our past projects and our award-winning record. Let us know if you have any questions about our hospitality projects. We’re always ready to discuss the future with you. ← School Bells are Ringing!